Boasting features that minimize drag and maximize speed, the Men’s Hurricane Wetsuit Cat 2 is the ideal choice for intermediate and beginner triathletes looking for an edge. Constructed with our state-of-the-art slick skin neoprene, every HCCOM6A wetsuit is reliable, resistant to abrasions and provides high heat retention. As one of the triathlon industry’s most durable textiles, slick skin neoprene is also designed to ensure a comfortable fit. Rather than a standard seam construction, each Cat 2 utilizes speed wrap paneling to comfortably hug and hold you in. Packed with advanced features at an affordable price, the Cat 2 wetsuit includes strategically placed elevation panels in the chest and core to help maintain lift in the water. When working in conjunction with form-fitting wrist cuffs, the result is maximized power strokes without any water intake. Each and every HCCOM6A wetsuit also includes quick release ankle cuffs, an innovative antimicrobial lining and state-of-the-art range of motion zones. 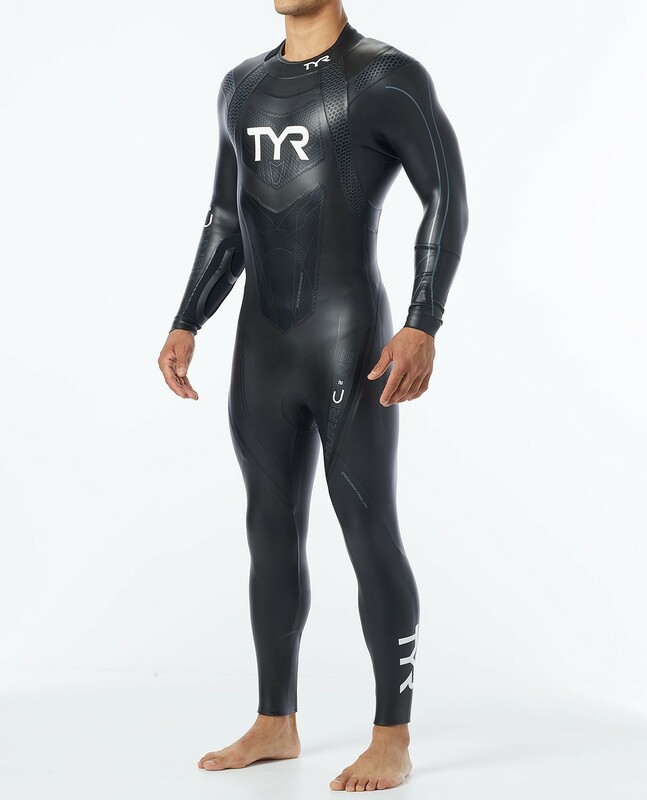 All TYR Hurricane wetsuits are WTC (Ironman) / USAT legal and provide UPF 50+ sun protection. Five core stabilization panels precisely target the muscle groups to elevate the swimmer ensuring optimal body position and preservation of core strength over the long-term of the swimming race. I'm a difficult fit for a wetsuit. I used the size chart, and at 6' 155 lbs was advised to purchase an M. Unfortunately, the suit is too tight: the ankle cuffs end up mid-thigh, and the upper collar constricts the neck area. Otherwise, it seems like a good product. I appreciated the carrying case, gloves and booties that came along. With gloves and booties the thing slips on fairly easily. That said, there was the ideal amount of water leakage once in the water: just enough to provide a slight warming buffer within the suit. Q: What is the thickness of the neoplrene used in the different panels? A: Thank you for contacting TYR Sport! We are always eager to answer any questions you have about our products. Our wetsuits range from 1.5mm to 5mm throughout the suit. Q: Wetsuit neoprene thickness ?? 3/2 , 5/3 ?? A: By design, thickness will range throughout the wetsuit, but total thickness will not exceed 5mm. Q: I am 183cm height and 71.5kg weight. I am not sure between M and M/l Size. A: Thank you for contacting TYR Sport, We are always eager to answer any questions you have about our products. Based off the height and weight you provided, it looks like you fall under a size Large, because of your height the suit may be a little snug on the shoulders if you size smaller. If you are not satisfied for any reason, we will gladly provide a merchandise refund or exchange within 30 days from purchase date. Exchanges and returns must be received in new and unworn condition. All tags and labels must be attached. Q: Could this wetsuit be used for activities outside of swimming? Surfing for example? Wakeboarding? A: Thank you for your inquiry. The Hurricane Wetsuit is constructed for triathletes and open water swimming. They can be used for surfing and wakeboarding, but may not provide the durability needed. As our suits are very soft, to give the swimmer the best range of motion for speed. We test in waters that are in the low to mid 50's (Fahrenheit) without issue. Q: What Cat 2 means? The Men's Category 2 Hurricane Wetsuit is the second level in our high performance wetsuits, at an unbeatable price. Constructed with Slick Skin Neoprene, the CAT 2 is the perfect wetsuit for aspiring triathletes and competitors, since it boasts minimal drag and maximum speed and durability in it's class. The Category 2 Wetsuit features elevation panels in the chest and core which elevate the swimmer's position in the water, ensuring optimal body positioning, buoyancy and speed while muscle groups are specifically targeted for core stabilization and long-term preservation of core strength. Alpha Catch Panels are added to forearms to perfect stroke. Meet our newest wetsuit class: The Category 2. Jam-packed with advanced features to maximize performance at an affordable price point, the all new CAT 2 wetsuit is constructed with Slick Skin Neoprene, which is perfect for beginner and intermediate triathletes. WTC (Ironamn) / USAT legal.